I was a pastor for more than 11 years. Looking back, I can see that I also had to deal with the same tension Luther and Calvin and the other Reformers had to deal with. Pastors of evangelical Bible churches say this sort of thing all the time: “Search the Scriptures!” This is standard Protestant boilerplate. But what do these pastors do when someone in their church accepts their “right” and “duty” to search the Scriptures and decides that what the pastor is teaching is not “in accord with the Word”? And what if that person wants the freedom to teach his “point of view” in the church, even as the pastor has the freedom to teach his “point of view”? What do these pastors do? How would I have responded? Does anyone think I would have responded: “Great! I’m so happy to see that you understand the implications of sola Scriptura and the right of private judgment and have taken your responsibility seriously! Tell me how it goes!” Anyone? Anyone? Obviously, not. Here’s what I would have done — what I would have had to do to maintain unity in the church. First, I would have asked to meet privately with him to discuss the issues he had with my teaching before he began his little “course” in Sunday School. Assuming he wasn’t able to convince me to change my views, during these meetings I would have tried to convince him that he was wrong and that I was right. And then, if this failed, I would have explained to him that he would either have to quit teaching his point of view in the church or take his private interpretation down the road to a church that agrees with him. Essentially, I would have shown him the door. This sounds reasonable. After all, you can’t have someone dividing the church by teaching in contradiction to the pastor. What would I say? What could I say? The ironic thing is: I may have just finished a sermon in which I mocked the Catholic Church for not allowing individuals to come to their own views but requiring them to accept the Church’s teaching! 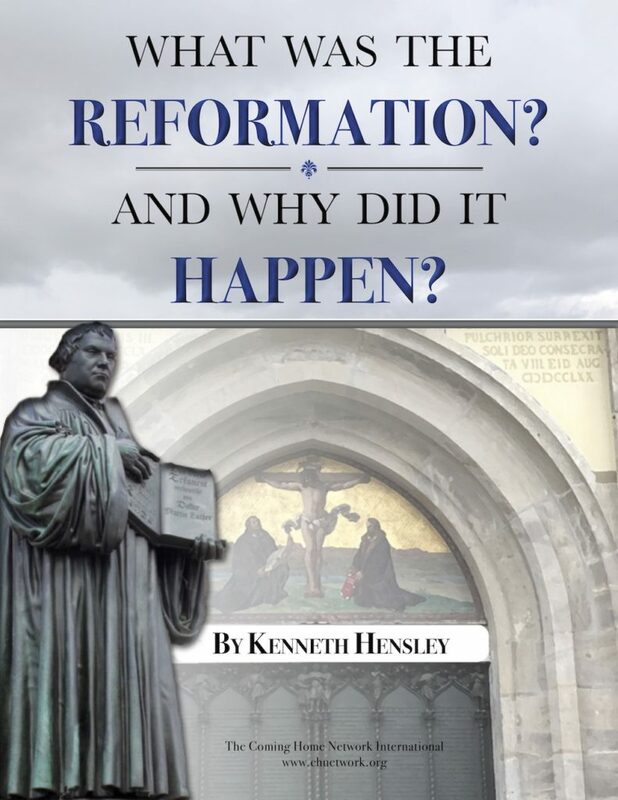 My point is that in the end, there’s nothing a Protestant pastor can do but what Luther and Melanchthon and Calvin did. 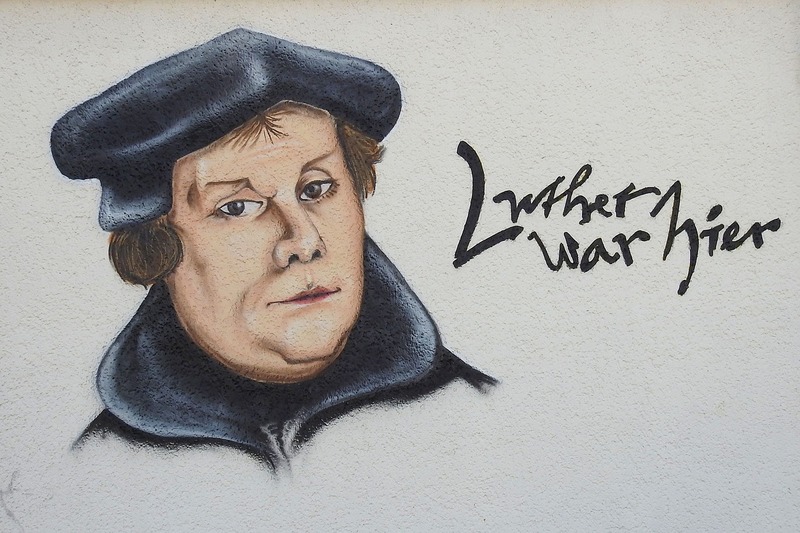 There’s nothing a Protestant denomination can do but what Luther, Melanchthon, and Calvin did. You can’t have the pastor at the 8:00 a.m. service teaching that Christ is truly present in the Eucharist and the pastor at the 10:00 a.m. service teaching that Christ is not. I think you can see now why Protestant churches have to continually split. Truthfully, I think the only reason Protestant churches don’t disintegrate completely is that most Protestants don’t really practice sola Scriptura and the right of private interpretation. For the most part, they simply accept as true whatever their particular denomination or tradition or pastor has taught them. The pastor, then, can teach the absolute right of private interpretation and encourage his people to study and decide for themselves, knowing that the vast majority of his flock will not take him up on it. And if some smart aleck decides to become an amateur Scripture scholar and comes to the conclusion that the pastor has been teaching heresy, he can be kindly shown the door. Ephesians 4:11-16 is a passage that knocked me off my chair when I was thinking through these issues and being drawn to the Catholic Church. In this passage St. Paul is discoursing on the oneness of the Church. In this context, he says something I had read a million times and yet its significance had escaped me. He says that God gave to His Church pastors and teachers specifically in order to build the Church up in unity. [He gave] pastors and teachers, to equip the saints for the work of ministry, for building up the body of Christ, until we all attain to the unity of the faith and of the knowledge of the Son of God … so that we may no longer be children, tossed back and forth and carried about with every wind of doctrine, by the cunning of men, by their craftiness in deceitful wiles. Clearly, it’s God’s will that Christians not be “tossed back and forth and carried about with every wind of doctrine,” but that the Church be unified as one. That is God’s will. And to that end, He gave His Church pastors and teachers. I remember the day I read this passage and the realization came to me: The arrangement St. Paul is describing here could only work if the pastors and teachers God has given to the Church have some authoritative body of teaching to which they are all bound. How can pastors and teachers be instruments of unity in the Church if each of them is free to exercise a right of private judgment and decide for themselves what Scripture is teaching? As the 500-year history of Protestantism has demonstrated, when each pastor and teacher is free to “decide,” they come to very different views. Some say Baptism and the Lord’s Supper are merely symbolic rites, others that they are grace-giving sacraments. Some conclude that the Church is to be ruled democratically, others by elders, still others by bishops. Some insist that we are saved by faith alone and that once saved, a Christian cannot lose his salvation. Others insist that salvation involves the believer’s cooperation in faithful obedience and that it most certainly can be lost … and so forth with a number of other doctrinal and moral teachings. And because these pastors and teachers do not agree with each other, guess what? They become the very ones stirring up the wind and waves of doctrine and tossing the children of God back and forth! Rather than serving as God-given agents of unity in Christ’s Church, pastors and teachers within the framework of sola Scriptura and the right of private judgment turn out to be the prime agents of division. This is precisely what has occurred. This was an important realization, one that drove me in the direction of the Catholic Church. I saw the fragmentation in which I was an active participant. I heard the prayer of Our Lord, “Father, bring them to perfect unity so that the world may believe and know that you have sent me” (John 17) and it struck me that this was simply impossible on the basis of sola Scriptura. No. If Our Lord desired that His Church be one — and it’s clear that He did — He had to have established that Church with some principle of divine authority. He had to. There was only one historic Christian Church even claiming to possess that principle of authority. And I tell you, you are Peter, and on this rock I will build my Church, and the gates of hell shall not prevail against it. I will give you the keys of the kingdom of heaven, and whatever you bind on earth shall be bound in heaven, and whatever you loose on earth shall be loosed in heaven (Matthew 16). Becoming Catholic wasn’t easy for me and my family. You could say I broke a lot of glass coming into the Church. And inside … I found Catholics wishing they were Protestants. I found Catholics moaning about the authority of the Church, the authority of Rome, speaking wistfully of a future, more democratic, Church where individuals could decide for themselves. I found Catholics ignoring or disputing or outright rejecting settled teachings of the Church.